Lucknow, in Uttar Pradesh, was and is the centre of chikan embroidery, renowned for its timeless grace and its gossamer delicacy, a skill more than 200 years old --- exploited, commercialis but not dead. In fact, the craft is alive and struggling to regain some of its former beauty and elegance. Chikan embroidery is done on fine cotton fabric. The garments are first stitched and then embroidered, whereas skirts, saris, and table linen are first embroidered and then finished. A study of the origin of chikan reveals that this form of embroidery had come to India from Persia with Noor Jehan, the queen of the Mughal Emperor Jehangir. The word chikan is a derivative from the Persian word 'chikaan' meaning drapery. Some, however, insist that the craft migrated from Bengal. What we know is that chikankari came to Oudh when Mughal power declined in Bengal and the artisans moved to the Oudh durbars, seeking employment and patronage. The craft flourished under the benign nawabi influence. The ladies of the harem vied with each other in making white embroidered caps for the nawabs in order to be noticed and favoured. Earlier garments were so fragile that they had to be discarded after a few washes --this explains why early samples of chikan garments are not available. With the British influence, designs became more formal and items other than ethnic apparel began to be created. This brought a formalisation of designs to a large extent, which resulted in an export market. These items found a place in the prestigious homes in Europe and England, specimens of which are still available. The bel or creeper was the most commonly used design";" individual motifs or butis of animals and flowers were also made. Fish (mahi) was a very common motif in Lucknow and used widely because it was the emblem of the Court of Oudh. The design to be embroidered is printed on the fabric with wooden blocks, using fugitive colours, which are commonly made by mixing a glue and indigo with water. For extra fine designs, brass-blocks are sometimes used. In chikan, the needle is held in the right hand while inserting it into the fabric, the left hand supports and controls the thread so that the stitches take the right shape. In traditional chikan no frames were used (though they are used now)";" the portion of the cloth to be embroidered is placed over the index finger of the left hand, supported by the rest of the fingers, leaving the thumb free. The needle is pulled away from the embroiderer who starts from the nearest end and finished at the farthest end. There is a discipline and method in the application of the stitches. The darn stitch is worked on rough cotton fabric to fill angular designs and to cover the surface of the fabric, while satin stitching is done exclusively on delicate fabrics like silk, muslin, or linen. In chikan some stitches are worked from the wrong side of the fabric, while others are worked from the right side. It is however unique in its discipline in as much as stitches designated for a particular purpose are used only for that purpose --- they are not replaced by other stiches. For example, the chain stitch (zanjeera) will only be used for the final outline of a leaf, petal, or stem. Different specialists work with different types of stitches. For example, open work or jaali is not done by embroiderers who do the filling work - each worker completes his/her bit and the fabric is then sent to the next embroiderer. The wages for each job are fixed separately. Chikan embroidery has a repertoire of about 40 stitches of which about 30 are still being used. These can be broadly divided into 3 heads - flat stitches, raised and embossed stitches, and the open trellis-like jaali work. Some of these have equivalents in other embroideries, the rest are manipulations that make them distinctive and unique. They cover almost all the embroidery stitches of the country and have interesting and descriptive names. Taipchi: Running stitch worked on the right side of the fabric. It is occasionally done within parallel rows to fill petals and leaves in a motif, called ghaspatti. Sometimes taipchi is used to make the bel buti all over the fabric. This is the simplest chikan stitch and often serves as a basis for further embellishment. It resembles jamdani and is considered the cheapest and the quickest stitch. Pechni: Taipchi is sometime used as a base for working other variations and pechni is one of them. Here the taipchi is covered by entwining the thread over it in a regular manner to provide the effect of something like a lever spring and is always done on the right side on the cloth. Pashni: Taipchi is worked to outline a motif and then covered with minute vertical satin stitches over about two threads and is used for fine finish on the inside of badla. (a) Ulta Bakhia: The floats lie on the reverse of the fabric underneath the motif. The transparent muslin becomes opaque and provides a beautiful effect of light and shade. (b) Sidhi Bakhia: Satin stitch with criss-crossing of individual threads. The floats of thread lie on the surface of the fabric. This is used to fill the forms and there is no light or shade effect. Khatao, khatava or katava is cutwork or appliqu? - more a technique than a stitch. Gitti: A combination of buttonhole and long satin stitch, usually used to make a wheel-like motif . Jangira: Chain stitch usually used as outlines in combination with a line of pechni or thick taipchi. Murri: A very minute satin stitch in which a knot is formed over already outlined taipchi stitches. Phanda: It is a smaller shortened form of murri. The knots are spherical and very small, not pear shaped as in murri. This is a difficult stitch and requires very good craftsmanship. Jaalis: The jaalis or trellises that are created in chikankari are a unique speciality of this craft. The holes are made by manipulation of the needle without cutting or drawing of thread. The threads of the fabric are teased apart to make neat regular holes or jaalis. In other centres where jaalis are done, the threads have to be drawn out. In chikankari, this is not the case. Names of jaali techniques suggest the place where they originated from --- Madrasi jaali or Bengali jaali ---- or possibly the place of demand for that particular jaali. The basic manner in which jaalis are created is by pushing aside wrap and weft threads in a fashion that minute openings are made in the cloth. Shape of openings and the stitches used distinguish one jaali from another. The source of most of the design motifs in chikankari is Mughal. Noor Jehan's personal preferences and desire to replicate the Turkish architectural open-work designs is said to have that led to the introduction of jaalis in chikan embroidery. The designs in chikan are graded and used according to the stitches employed - murri ka buta and tepchi ka jaal --- though terms like hathi (elephant) and kairi (mango) are also used to signify the shape of the motif. It is however the stitch employed that is the established nomenclature. The production process of a chikan garment, assuming it is a kurta, goes through several processes. In each process a different person is involved. The final responsibility is, however, that of the person ordering the manufacture, who is also usually the seller. Chikan work involves several stages. The fabric is cut by the tailor into the required garment shape, after which the basic pre-embroidery stitching is done so that the correct shape is available to the block-printer to plan the placement of the design. The design is printed on the semi-stitched garment with fugitive colours, and the embroidery of the garment is then begun. After completion, the article is checked carefully since most defects can be detected at first glance. However, the finer flaws surface only after washing. The washing is done in a bhatti, after which the garment is then starched and ironed. The whole cycle can take from one to six months. 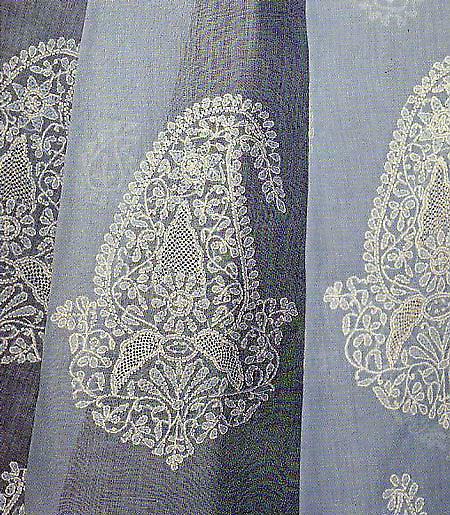 Originally, chikan embroidery was done with white thread on soft, white cotton fabric like muslin or cambric. It was sometimes done on net to produce a kind of lace. Today chikan work is not only done with coloured threads but on all kinds of fabrics like silk, crepe, organdie chiffon, and tassar.